So you live in North Carolina and want to go to the beach. Do you head east or west? It depends on if you want to go to the State’s coast on the Atlantic or Pacific. Of course, North Carolina does not have a Pacific Coast. That wasn’t always the case. The original Charter for Carolina on March 24, 1663, defined Carolina as extending “to the west as far as the south seas”, i.e. the Pacific Ocean. Although that looks like an awful long way to North Carolina’s west coast, some cartographers in the 16th & 17th centuries thought it was a much shorter distance. We…found there an isthmus one mile wide and about two hundred miles long, in which we could see the eastern sea from the ship, halfway between west and north. This is doubtless the one which goes around the tip of India, China, and Cathay. We sailed along this isthmus, hoping all the time to find some strait or real promontory where the land might end to the north, and we could reach those blessed shores of Cathay. This isthmus was named by the discoverer “Varazanio,” just as all the land we found was called “Francesca,” after our Francis. Verrazzano’s faulty conclusion that the Outer Banks of North Carolina represented a narrow isthmus between the Atlantic and Pacific Oceans led to a few very peculiar maps, including several manuscript maps from the 1520s. The most famous and most commonly available printed map depicting the “Sea of Verrazzano” (as the eastward projection of the Pacific has been called on such maps) is Sebastian Münster’s Nouae insulae XXVI noua tabula, first published in 1540. 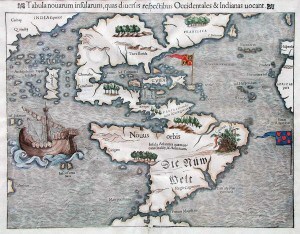 This particular map by Münster was the most widely circulated map of the New World throughout the mid to late 16th century, and it is found with a variety of letterpress titles in the top margin. from the head of James River above the falls . . . will be found like rivers issuing into a south sea or a west sea, on the other side of those hills, as there is on this side, where they run from west down to the east sea after a course of one hundred and fifty miles. Farrer’s description was subsequently included in Virgo triumphans, or, Virginia in generall, but the south part therof in particular including the fertile Carolana, and the no lesse excellent island of Roanoak, richly and experimentally valued… by Edward Williams, with a map by Farrer included starting with the 3rd edition in 1651. On his map, Farrer claims that the “happy shores” of New Albion (California) may be reached from Virginia “in ten dayes march with 50 foote and 30 horsemen from the head of [James] River”. Geographic reality eventually conquered cartographic fantasy and, after Farrer’s map, the Sea of Verrazano evaporated from printed maps. A much more thorough discussion and references on the Sea of Verrazzano can be found in Dr. Seymour Schwartz’s book, The Mismapping of America (2003, U. of Rochester Press), in which the second chapter, “Cinching a Corset of Convenience”, is devoted to this topic. The above Verrazzano quote is from: The Written Record of the Voyage of 1524 of Giovanni da Verrazano as recorded in a letter to Francis I, King of France, July 8th, 1524 [Adapted from a translation by Susan Tarrow of the Cellere Codex, in Lawrence C. Wroth, ed., The Voyages of Giovanni da Verrazzano, 1524-1528 (Yale, 1970), pp. 133-143]. This entry was posted in 16 & 17th Century and tagged Sea of Verrazano, Sea of Verrazzano by crmaps. Bookmark the permalink.